AAA the "Games Master" has escaped King Roothless, and boy is he mad! After days of plotting, AAA has come up with a plan to seek revenge on the evil king - by not letting him sleep! AAA confiscated a yoyo from Scram while inside Dungeon Dash and plans to make Roothless 'slumberless' by hitting the King with his yoyo right as he's about to doze off! Use your left and right arrow keys to make your way around the room, firing your yoyo at Roothless using your space bar. Guards will be patrolling the room and getting your yoyo caught in their light will deduct one yoyo from your stash. The game will be over once you run out of yoyo's to shoot. There are various items you can pick up along the way by simply hitting them with your yoyo. Some items can be used to your advantage while others will hurt you by subtracting your total amount of yoyo's. 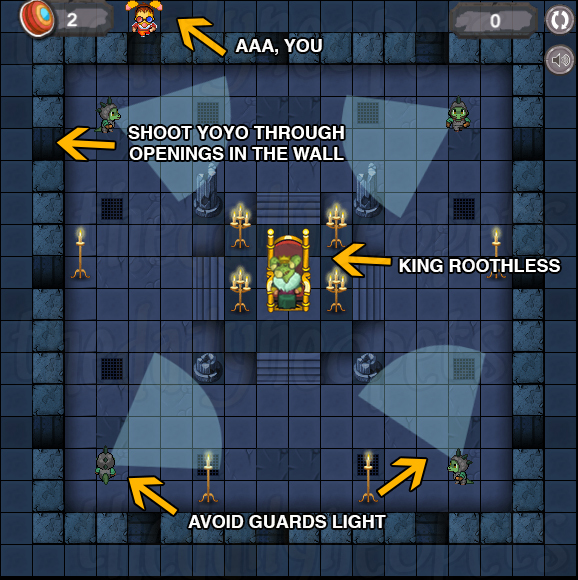 AAA's Revenge is a simple game once you figure out the timing of the guards and when to shoot your yoyo - but that shouldn't be too challenging for a Game Master!